#HLSrecap Top 25, brought to you weekly during college football season. Last football season, I joked that #HLSrecap needed to find a corporate partner so I could reward you people with nimble thumbs and quick wit. But we didn’t want anything too “corporate” or stuffy, and I hatched upon the idea of finding a whiskey partner. If you read Notre Dame Magazine or frequent indiegogo, you may have heard of Indiana Whiskey. If you don’t, then here’s your primer: they have strong ND ties and an independent spirit, something we here at HLS know a little something about. They’re based in South Bend, and everything that goes into making their whiskey is made in the state of Indiana. They’re veteran owned, something veterans and HLS authors, Bayou Irish and Superman TD Jesus, appreciate. And they’re eager for an introduction into a group of ND folks who have an appreciation for whiskey, which is where our shared story begins. Yes, if you’re keeping track at home, that’s 13 pairs of #wHLSkey glasses 13 bottles of #wHLSkey we’re giving away to you beautiful people during the 2014 ND Football season. No, I haven’t yet decided how I’ll handle repeat winners in the same year. I’m guessing T.R.O.L.L. Points will be involved somehow so we can share the wealth. Be cool, everybody. Yes, I think sharing a photo of your hard-earned glasses and/or bottle across various social media channels would be a fine gesture. No, you do not need to be awarded #HLSrecap MVP to support and enjoy Indiana Whiskey. Yes, you need to be 21. And I highly encourage responsible consumption. Did I miss anything else? Leave them in the comments or hit me up on the Twitter. And not to bury the lede too much (too late? ), but we have a new #HLSrecapMadness Champion. In the end, it wasn’t very close. Ramzy ran away with in the Championship Round, besting a worthy opponent. I especially love how y’all chastised me in the early rounds for the horrible seeding, gleefully cheered as the 1-seeds (Tex, Poot, Lena, and LOUIS NIX OF ALL PEOPLE) fell one-by-one…and then, in a delightful pivot, complained about the remaining middle seeds and claimed these leftover tweets weren’t very funny. 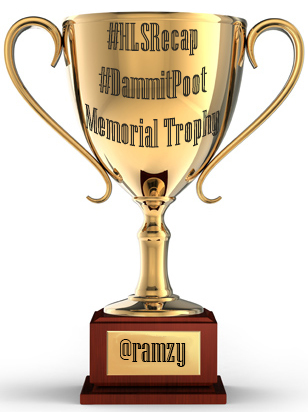 Ramzy, come on up to the podium, please accept the #DammitPoot Memorial Trophy (existing in digital form only and depicted on your right), and…oh, you have a few words? Well then, by all means, the floor is yours. October 22, 1983: That’s the day I saw Notre Dame football for the first time. I was nine years old, sitting on the shag carpet in front of the family room television. This team with green jerseys and shiny gold helmets was playing Southern California. Living in a town with a university where the Rose Bowl meant absolutely everything, I was already quite familiar with USC – but I had never seen this green and gold team. They didn’t play Ohio State or Iowa or any other school I paid close attention to, but in an era when most games weren’t televised that was quite normal. There were a lot of mystery teams back then. The green and gold team had a running back who seemed to be doing whatever he wanted. There was no response. Like many dads, a couch in front of a television with soft, ambient noise coming out of it was a recipe for nap time. The running back was Allen Pinkett, and nine-year olds’ brains often work in weird ways. Pinkett. Pink. Green. Gold. That’s cool. It’s possible I had seen the Irish play before in their traditional blues or whites, but I have no memory of it. I decided at that moment I liked Allen Pinkett. Much like the game of college football itself, this victory wouldn’t have been possible without Michigan or Notre Dame, which is the game I was watching intently last fall when the winning tweet was serendipitously composed. I’m also indebted to Patrick Swayze – not just for his work in Roadhouse or in that SNL Chippendales sketch – but for providing me with creative inspiration from beyond the grave both in film and in reality. Notre Dame tackles like Patrick Swayze in Ghost. Or like Patrick Swayze now. Like both. I’d also like to thank FakeSwarbrick, OptimisticDomer, PootND, Dixie_Domer, and rakesofmallow for their worthy challenges en route to HLS glory, as well as Tex and IrishElvis for administering a tournament that – as an Ohio State fan – I found more entertaining than this year’s NCAA tournament. It’s worth noting that all of the HLS entrants scored as many points as both Amir Williams and Trey McDonald (OSU’s two big men) scored against Dayton in their only tournament game – combined – which makes all of us winners. It’s funny to think about the things that unite us: Twitter, college football, voting on college football tweets in April, silly, curious eight-year old daughters (I have one of those too), Allen Pinkett in a green jersey and a gold helmet slicing up Trojans on standard-definition television and dropping everything and anything imaginable into a bracket as college basketball season closes, allowing the tempest of the college football offseason to arrive in earnest and swallow us all. May we all survive the coming months, and may you emerge from the summer as irrationally exuberant and optimistic as ever…while her loyal sons are marching onward to victory.